Resource Center Guide to Experiential Therapy in Addiction Treatment What Is Animal-Assisted Therapy & How Does It Work? Most people love animals and find them to have a calming effect on their psyche. As Psychology Today discusses, human coexistence with other animals is factored into our DNA as we are pack animals by nature.For this reason, it can feel rewarding to care for and spend time with an animal because it was advantageous to us from an evolutionary standpoint. It’s not just about what animals can do for humans. While making an animal happy is not particularly complicated, humans can experience immediate gratification when they care for animals. In short, the happiness-making is reciprocal between humans and other animals. A Purdue University study reviewed 14 clinical trials that considered the impact of animal-assisted therapy on children with autism spectrum disorders. Each of the clinical trials revealed that the children who received animal-assisted therapy showed improvements in 27 of 30 of the treatment outcomes measured. One study surveyed 28 separate animal-assisted therapy research projects conducted from 1997 to 2009 in the context of treatment for people with schizophrenia, Alzheimer’s disease, Down’s syndrome, and developmental disabilities. Each of the 28 studies found that the participants with these (and other) disorders who received animal-assisted therapy received benefits that the control group did not. 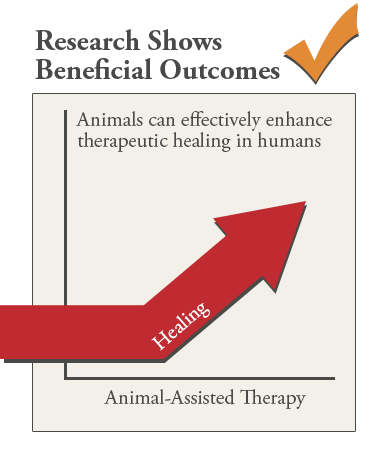 In a neuroscientist-led review of 28 animal-assisted therapy studies conducted from 2005 to 2011, 26 of the studies reported beneficial outcomes for participants who received this form of treatment. Note: A review of 49 animal-assisted therapy studies, including 19 unpublished dissertations of PhD candidates, supported the “file drawer effect” (the tendency for research studies with positive outcomes to be published while studies with negative outcomes are not). The unpublished works showed a lower incidence of positive results compared to the published ones. This finding calls into question if animal-assisted therapy is effective enough to qualify as a legitimate therapeutic approach. Although animal-assisted therapy is not without its critics, the general tenor is welcoming. To illuminate this point, consider the experience of Cynthia Chandler, professor of counseling at the University of North Texas and an author on the topic of animal-assisted therapy. Chandler has been working and volunteering in this area for nine years (and counting) at an inpatient psychiatric hospital. Chandler has found that some of the benefits of animal-assisted therapy defy quantification but are entirely evident to her in practice. For instance, Chandler works with her dog, Bailey. The healthy, loving, and caring relationship Chandler has with Bailey serves as a positive model for clients and helps them to feel safer, which in turn promotes greater participation in therapy. These types of soft effects may be difficult to research, but as animal-assisted therapy works on the level of the psyche and emotions, its contributions go undetected in many ways. Animal-assisted therapy has also withstood the test of time. While this practice gained legitimacy in the mainstream therapy community in the early 1990s, in the late 1800s, Florence Nightingale made significant discoveries in this area. It is a little-known fact, but true nonetheless, that the founder of psychoanalysis, Freud himself, incorporated his dog Jofi into some of his psychotherapy sessions with clients. Animal-assisted therapy found its way into the life of some of the most prominent healing workers of the 19th and 20thcentury, such as Nightingale and Freud, due to its observed benefits and not simply human love for animals. A 2007 study discussed in Psychology Today provides further illumination of how animal-assisted therapy is particularly effective at improving a recipient’s psychological health. 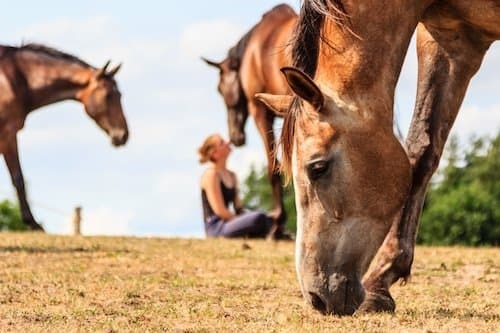 The study focused on equine-assisted therapy and found that those who participated in the clinical trial immediately, and at the six-month follow-up mark, showed significant improvements to their mental health. The benefits were found to be akin to the level that accomplished meditators report. The analogy of animal-assisted therapy to meditation itself speaks to the healing effects animals can have on the psyche. Animal-assisted therapy along with animal ownership and pet therapy also provide physical health benefits. Research in the area of cardiovascular health shows a positive link between having a pet and improved heart function. In 2013, the American Heart Association advised the public that having a pet, particularly a dog, likely reduces the risk, or may even play a causal role, in the reduction of the risk of cardiovascular disease. Further, a 1995 sub-study led by the Cardiac Arrhythmia Suppression Trial involved 369 participants who had a heart attack (myocardial infarction). 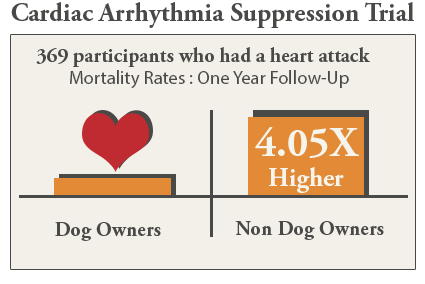 At the one-year follow-up mark, the heart attack survivors who owned dogs had a significant increased survival rate (the mortality rate was 4.05 greater for those survivors who did not have a dog). 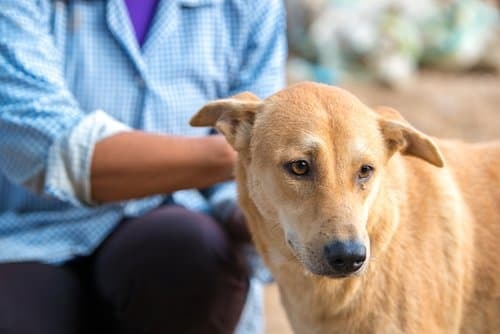 In short, the study showed that dogs provided a survival benefit that could not be explained by other factors, such as the person’s demographics and other psychosocial factors. The species of animals that have been incorporated into substance abuse recovery programs vary widely and include but are not limited to dogs, cats, horses, donkeys, llama, rabbits, dolphins, and wolves. A drug rehab center may host therapy animals that travel to the site at an agreed-upon schedule for sessions, or the center may house the animals permanently, such as some equine therapy programs that maintain stables. 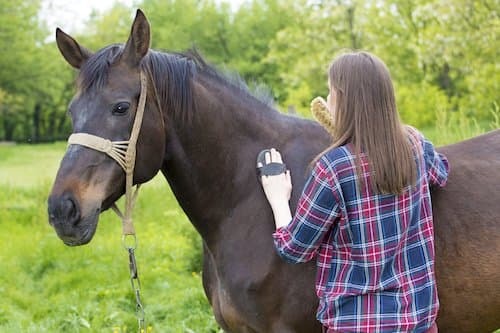 As the sessions are therapist-led, the therapist is licensed to handle the particular species of animal that is involved in the animal-assisted therapy. When rehab centers offer animal-assisted therapy, they typically list this service on their official site as well as in brochures. The specific species of animal involved will likely also be discussed. The treatment schedule will include the time and days that are set aside for animal-assisted therapy. Many centers make participation optional. As canine-therapy and equine-therapy are the two most common types of animal-assisted or pet therapy offered in drug recovery programs, they will be further elaborated upon in this discussion. 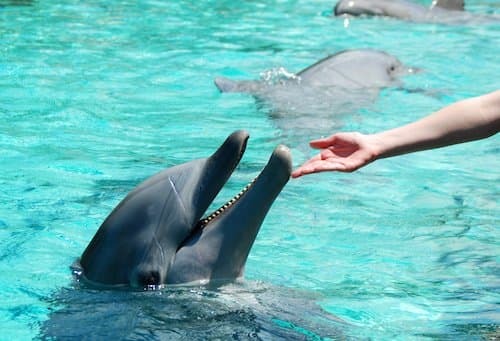 Although open-water dolphin therapy is only reportedly used in Hawaii, a brief discussion to this approach is made as an example of how far-reaching animal-assisted therapy can be. While it appears that animal-assisted therapy is beneficial overall, the particular type of animal species involved can influence the process and for this reason a closer look at some animals is helpful. While there are numerous research studies pertaining to the benefits of animal-assisted therapy, these trials are conducted across numerous healing contexts. Where studies focused on the substance abuse recovery setting are available, they are typically individuated by the species of animal involved in the sessions. According to one pilot project involving canine therapy in substance abuse rehab centers, the therapists found that they had increased access to information about the participants’ past history of drug abuse, emotional state, and ability to work with participants to develop drug-free coping strategies for life. The canine-assisted therapy pilot project ran for 12 weeks at a rehab center located in Troy, New York. The project involved three dogs that have an International Therapy Dog certification. In an endearing twist, one of the dogs, a pit bull, was a rescue dog from a house used by people addicted to crack cocaine. Of the 56 recovering persons who participated (46 males, 10 females), 64 percent (28 females, 8 males) actively participated with the therapy dogs (participation was optional). The canine-assisted therapy sessions occurred once a week for 60 minutes. This is a typical scheduling, and many rehab centers that offer canine-assisted therapy are likely to offer a similar time/day format. The recovering individuals who participated in this program socialized with the canines, did some obedience training with them, and guided them through a miniature agility course. These disclosures were considered to be an achievement, as it is well noted in the substance abuse treatment context that recovering persons sometimes have a difficult time working with staff as they see them as authority figures. The therapist involved in the canine-assisted therapy sessions had significant insights including how participants reacted to the perception of being rejected by the dogs. Therapist were able to intervene and instruct the participants who felt rejection on how to improve communications with the dog, such as not rushing the dog or expecting bonding to occur immediately. Some of the participants advised the therapists that they acted and reacted to the dogs as they would other humans. The insights gleaned could, in turn, pave the way to improved approaches to, and interactions with, humans. The type of dog present also influenced the nature of disclosures made. For instance, when the pit bull was present, participants tended to discuss their history of violence and any exposure to animal cruelty. It is thought that the pit bull’s presence triggered these particular disclosures because pit bulls have a history of being involved in the drug use community as guard dogs and fighting dogs. As the pit bull was associated with being a victim, participants more readily discussed their history of victimhood in childhood and adulthood. This communication was significant, as there is a general consensus in the treatment community that anger, resentment, and an inability to express these emotions are key experiences underlying drug addiction. The publication of the bestselling book The Man Who Listens to Horses drew international attention to the wondrous nature horses and their potential to help heal humans. The author, Monty Roberts, reportedly faced abuse and neglect at his father’s hands while growing up on a horse ranch. Roberts instinctively bonded with the horses around him, in part as a means of coping with his circumstances. When it came time for Roberts to train horses, he felt a more compassionate approach should replace the historical approach of “breaking” a horse in. As Roberts himself had been exposed to abuse, he made a both conscious and instinctive decision not to inflict that pain on another living being. The result was that Roberts developed a highly effective and gentle method of taming horses. While this equine training method is an achievement, it has proven secondary to the greater message Roberts has sent across the world— each person has the ability to end a cycle of violence and treat the world and all its inhabitants with love and care. For many, the golden insight of Roberts’s work is that a compassionate approach to any problem is actually the most effective one. In a typical session in a rehab facility, a therapist works with the recovering person on how to properly engage the horse in positive interaction. For example, a client may lead a horse around an enclosed space without using physical contact. In this way, the client must learn how to appropriately communicate with the horse. The client who takes a hostile approach to communicate with a horse will quickly learn that behavior such as yelling, making threats, or snapping fingers will simply not work. In fact, horses must be led by people walking alongside them; a horse cannot be led from the front nor prodded from the back. In sessions, the horses essentially teach the recovering person how to treat them. This type of interaction is a gentle way of teaching the recovering person to question longstanding forms of communication and to try new and more sensitive approaches. In addition, the improved communication paves the way for building trust. Communication is the foundation of trust; although this simple tenet may not be obvious, equine-assisted and other animal-assisted therapy can help those in recovery to learn this foundational principle and use it to create new drug-free lives. At present, it appears that only one rehab in the US has a program that allows its clients to swim in open water with dolphins. In addition to interacting with the dolphin, the benefit of this approach is reportedly to expose recovering persons to “the wild.” According to Eliza Wille, the program’s director, the uncontrolled ocean setting quickly illuminates what skills recovering persons have and do not have. When in an unpredictable setting, such as the ocean, therapists are able to help recovering persons recognize how they act, react, and cope with stressful situations. Wille shares that her clients in dolphin-assisted therapy tend to have co-occurring disorders (a substance use disorder and at least one other mental health disorder). Clients who have interacted with the dolphins report an improvement in their symptoms. According to Wille, her clients have stated that they feel at peace, more open to forgiveness, a sense of belonging and acceptance, and even joy. These are life-affirming feelings that are transformative for a recovering person who has a history of self-harm or victimization from drugs and other sources. Twelve-Step programs and animal-assisted therapy can overlap in terms of treatment intentions. Although there are research-based treatment approaches to substance abuse that have been shown to work, the paths to recovery are many. Twelve-Step mutual aid meetings and animal-assisted therapy, as the canine-work discussed illuminates, aim to open up communication, identify sources of pain, build trust, and help recovering persons to develop healthy life skills. Animal-assisted therapy is a treatment approach in its own right, but it can also be serve as a form of 12-Step readiness work. Although recovering persons may have their first exposure to animal-assisted therapy in rehab, sessions can be included in the aftercare process as available locally. But if not, the experience of animal-assisted therapy could improve recovering persons’ 12-Step meeting participation during and after rehab. It is well established in the field of substance abuse treatment that 12-Step meeting attendance is a staple of aftercare. Fortunately, a variety of groups – the “Anonymous” lineage (such as Narcotics Anonymous) and non-faith-based groups such as SMART Recovery – meet in a variety of locales. These meetings are always free to attend, and there are few to no barriers to entry (for instance, Anonymous groups only ask that the participant has a desire to stop using drugs). As this discussion has illuminated, although animal-assisted therapy involves lovable animals, it is not intended to simply be a feel-good experience. This approach to helping addiction recovery is entirely goal-oriented. Animals serve as guides, and although they may not have the human faculty of speech, they are excellent with communication. Working with animals can help to induct recovering persons into new ways of thinking, communicating, and solving problems. 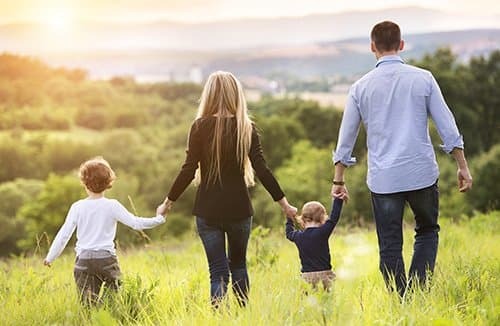 Though this therapeutic approach is not intended to replace traditional drug recovery approaches (e.g., medications, individual therapy, and group therapy), research shows that it serves as an effective auxiliary program component. As research expands in this area, animal-assisted therapy may develop into a staple practice rather than a niche one, and become a covered service across numerous health insurance plans.